I went out on a limb with this recipe. 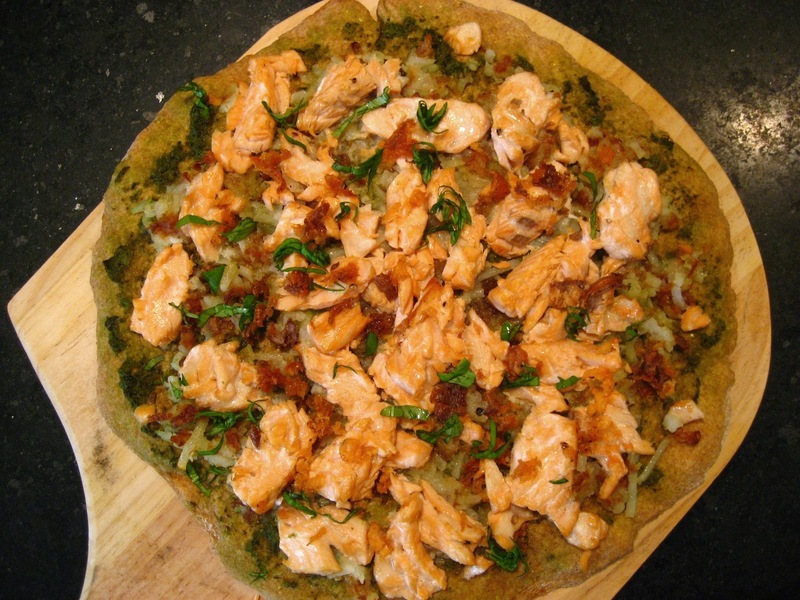 Salmon and hash browns on a pizza sounded really good. Somewhere between the planning and execution, this dish failed to achieve its potential. So, I humbly ask of you (the blogosphere): try this recipe, add your own variations, and reply back in the comments. I’m certain there is really good food in here – we just have to find it. Preheat your oven to 420 F. Salt and pepper the salmon and hash browns. Heat 1 tsp of cooking oil in a large skillet over high heat. When the pan is good ‘n hot, add the salmon fillet. Only let it cook for about 1 min per side, or until a nice crust has developed on the outside. It should still be very raw in the middle. Remove the salmon from the pan, scraping up all the bits that are stuck, and let rest on a plate. Add the remaining oil to the pan and cook the hash browns until crispy. Alternately, you can toss with oil and broil the potatoes until golden. The idea here is to introduce crunch. Spread an even layer of pesto across the pizza dough. Add the hash browns. 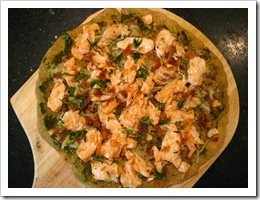 Flake apart the salmon fillet with a fork and sprinkle over the pizza. Suggestions for brave souls: The pesto flavor wasn’t strong enough to stand up to the salmon. I might recommend a strong honey mustard or a honey-balsamic glaze instead. Also, the hash browns didn’t end up bringing much crunch to the party when I made mine. I might substitute shredded cabbage, added after the pizza has come out of the oven. Good luck, and let me know how it turns out! I walked by a “Wolfgang Puck Express” in the airport last weekend and I noticed that there was a salmon pizza on the menu. Obvoiusly Wolfgang stole MY recipe and then retroactively added it to his franchises’ menus. He’s a crafty one, that Puck!